We’re planning on leaving Sydney in the next year or so, due to starting a family and needing a 4-bedroom house. But where to move to? The choice is overwhelming. In this series of posts, I explore a plethora of possible places – many of which we’ve visited – in an attempt to reach some sort of conclusion. First up – Bellingen. 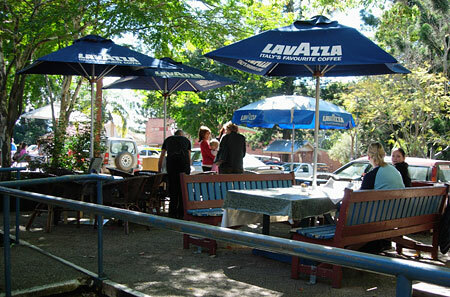 Bellingen is a vibrant country town nestled in the middle of the Bellinger Valley, south-west of Coffs Harbour, NSW. We first heard of it through some friends of ours; their son lives in an intentional community just outside Bellingen proper. For such a small town – population: 3,000 – Bellingen is a truly happening place. It has a famous jazz festival; lots of great cafes and restaurants; two good pubs; a very strong community feel; and a bit of an “alternative” culture (think Glastonbury in the UK, or Sydney’s Newtown). It also has a bit of history, with some lovely heritage buildings in the town, and the scenery is simply stunning. Just the kind of place we’re after, in fact. We’re currently scouring the country for suitable places; so far we must have checked out over 50 villages, towns and cities up and down the east coast. I’ll be talking about each of these places, including their pros and cons, over the coming weeks. Stay tuned. You are currently browsing the The Good Oil: Living in Australia as an Expat weblog archives for September, 2007.